United States. 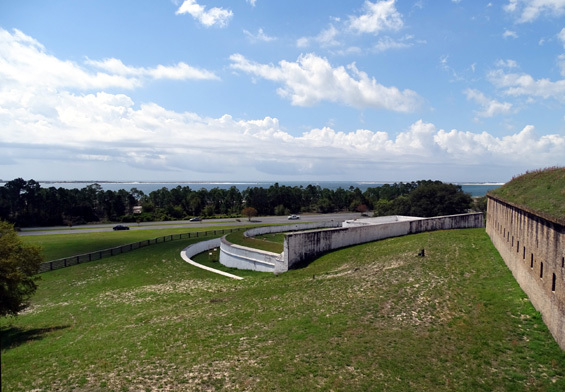 Tour the visitor center, Fort Barrancas, and Spanish Water Battery. But they are -- and the best thing is that the public is encouraged to visit them. Numerous folks come on base to see the Blue Angels precision aerial demonstration team do their practices in the spring and to visit the National Naval Air Museum. Not as many know about the fortifications but they may as well extend their visit to include those, too. 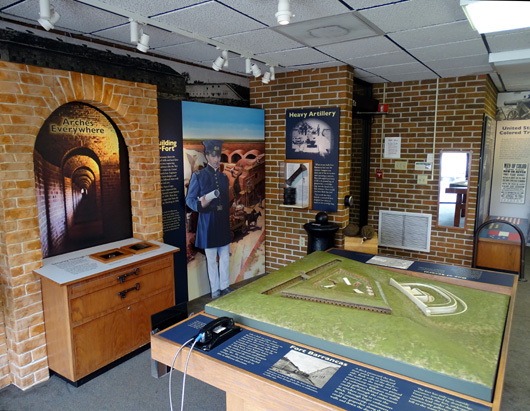 Start your visit at the Fort Barrancas Visitor Center, where you can watch a 15-minute video about the various fortifications, peruse the exhibits, talk to National Park rangers, and pick up brochures and maps of the structures and trails on site. 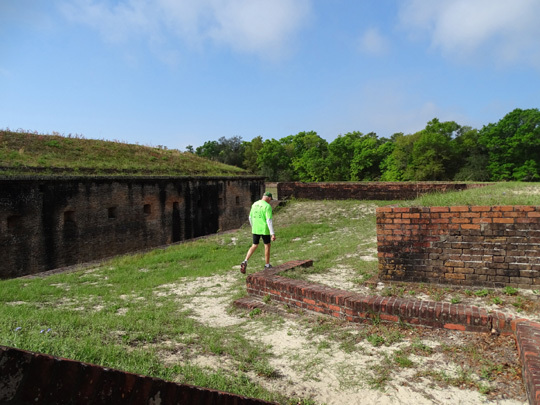 You can tour the visitor center, fort, and water battery in a couple hours or less. 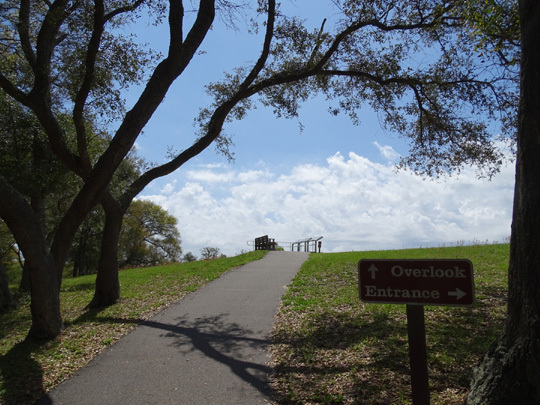 Add more time to tour the Advanced Redoubt and walk one or both trails in the park. Both trails begin at the visitor center. A half-mile Woodland Nature Trail loops through pleasant maritime forest terrain. I walked it on one of my four visits to the fort area. The Trench Trail connects the fort to the Advanced Redoubt but we drove to it one day we were in a hurry, instead of walking. Because we weren't the only ones interested in claiming this territory! 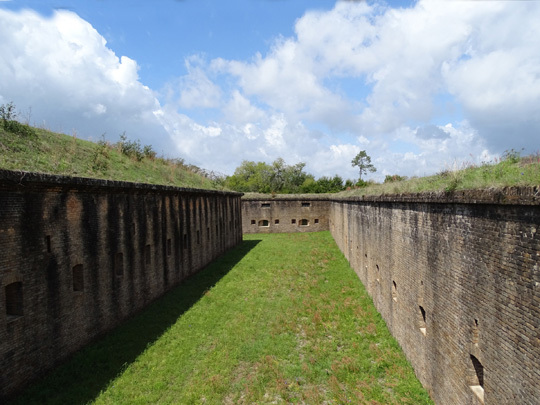 The U.S. Army built Fort Barrancas in the 1840s as one of four fortifications to protect Pensacola Bay and the Navy Yard from attack. 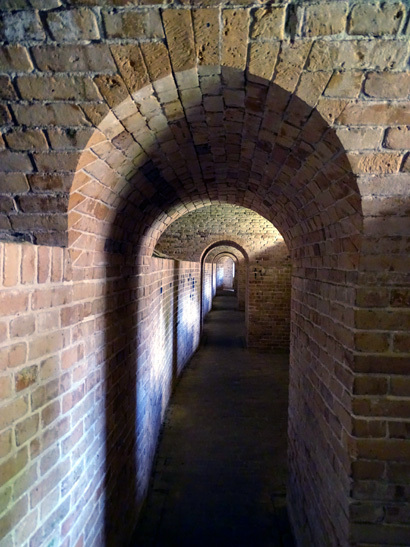 What I count as the fifth fortification is the Spanish Water Battery, located just below Fort Barrancas. France and Britain were also interested in governing this area since its discovery by Europeans 'way back when. 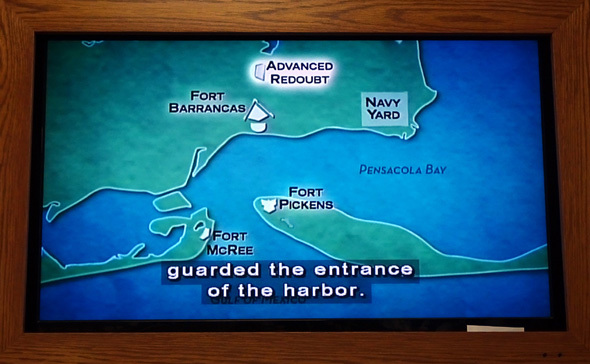 Fort Pickens on Santa Rosa Island and Fort McRee on Perdico Key guarded the channel from attack by sea. 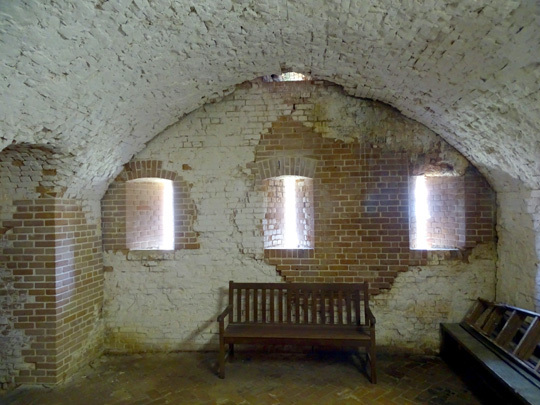 Fort Barrancas and its water battery, situated on a bluff facing the harbor entrance, could support their crossfire and fire shots at ships that entered the bay and harbor. 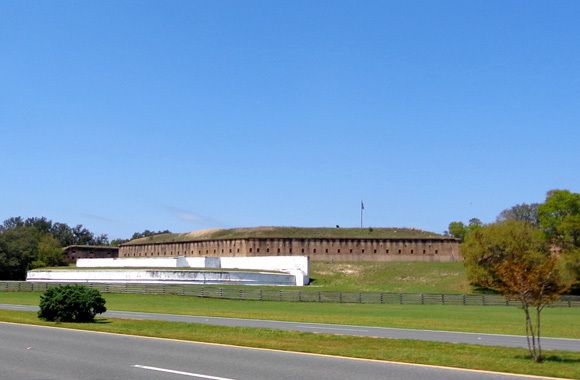 The Navy Yard was also vulnerable from land attacks from the north, so the Advanced Redoubt was built to protect it and Fort Barrancas. 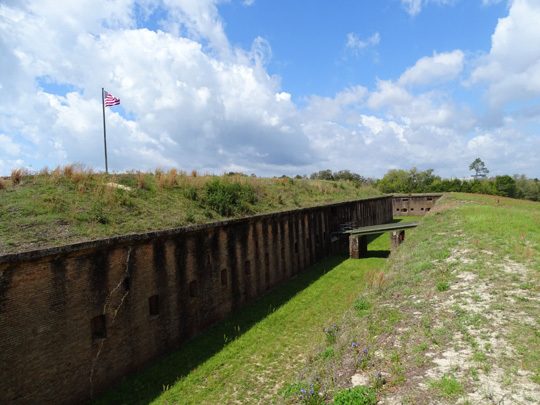 During the Civil War the Confederates briefly held Fort Barrancas and exchanged gunfire with Federal forces at Fort Pickens. 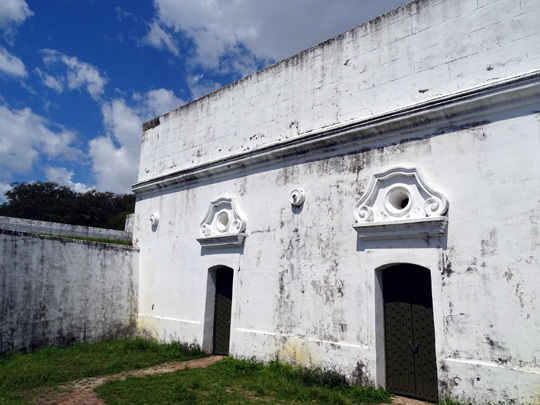 The Bateria de San Antonio was built in 1797. 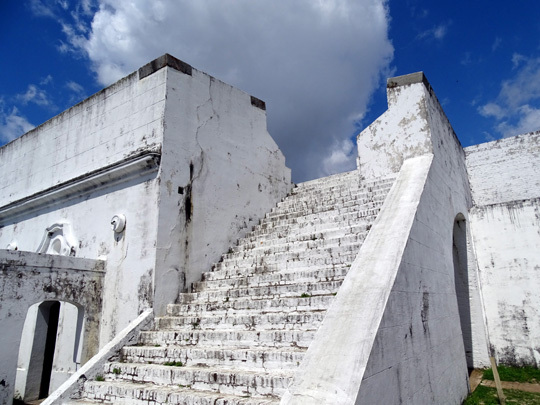 After recapturing the Pensacola area from the British, the Spanish decided to construct this fortification as part of a plan to strengthen harbor defenses. The maximum range of smoothbore cannon at that time was about one mile. 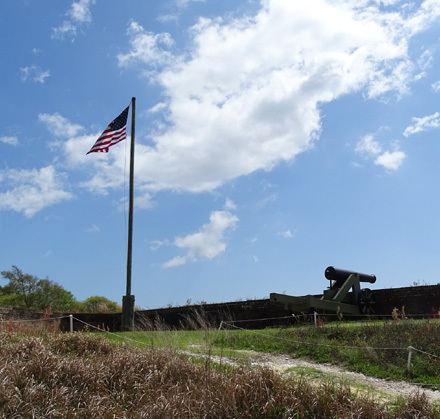 Americans modified and armed the battery while building Fort Barrancas in the 1840s. I liked how photogenic this building is. I'm guessing it's open at certain times for public viewing but we just weren't there at the right time. 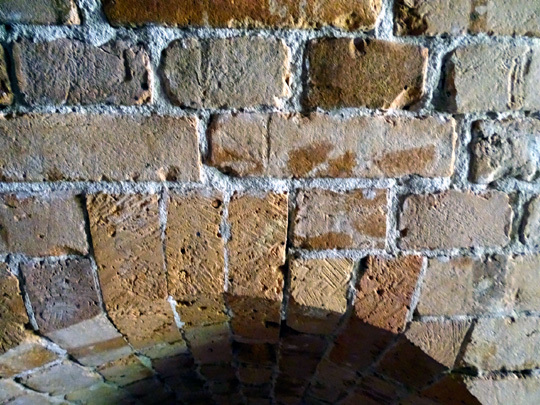 Once inside the thick walls, you can go right or left and follow the photogenic arched hallways around the entire rectangle of the fort. Halfway around the interior of the fort is another opening to the bay (south) side. You can access the Spanish Water Battery from this area, too. You have to walk down a long, dark tunnel to reach it but the effort is worth it. 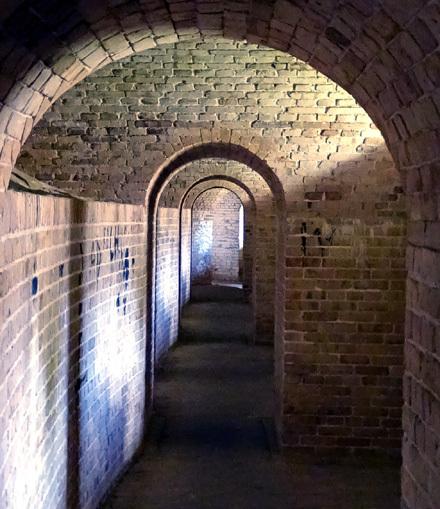 After we toured the water battery, we walked back up the long, dark tunnel to the fort, continued going CCW through the arched hallways, and back down to the visitor center. 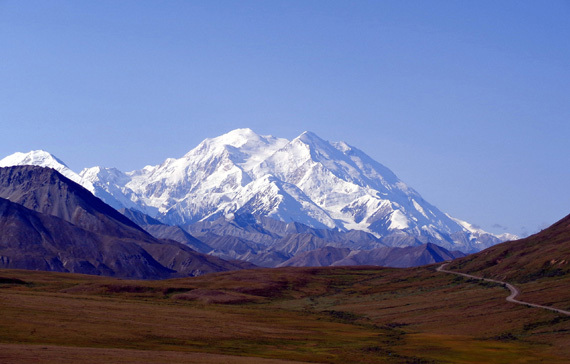 Guided tours are offered by the Park Service. We didn't take one of those but I'd like to do that when we come back to this area again. This half-mile loop begins from the visitor center parking area. 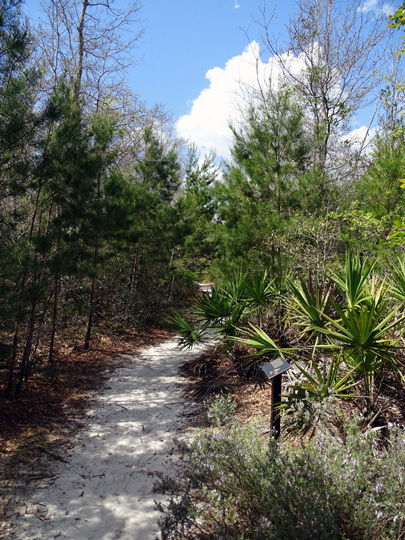 It's a pleasant little walk on a cool day through Pensacola's maritime forest environment. 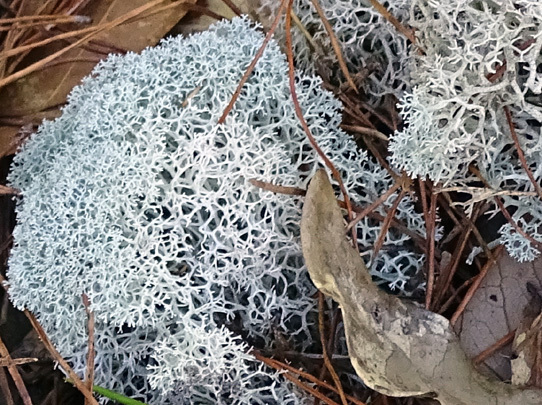 These lichens are dead ringers for ones I've photographed in alpine areas of Alaska and Canada! 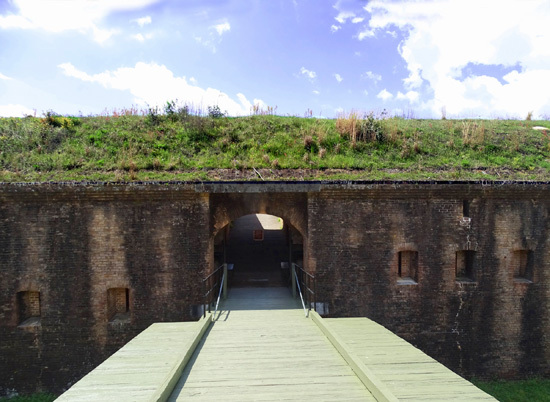 There is another path, the Trench Trail, that leads visitors to the Advanced Redoubt, farther up the bluff. 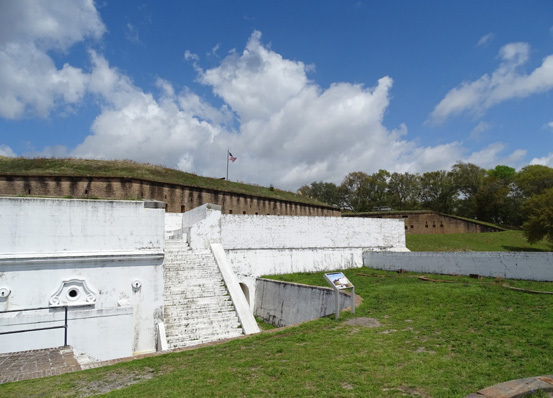 This fortification was built to further protect Fort Barrancas from a land assault. It's a half-mile walk from the fort, or a little further to drive. 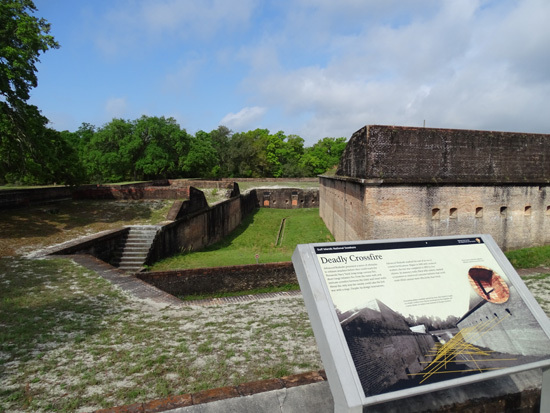 This fortification is also open at certain times for self and guided tours. 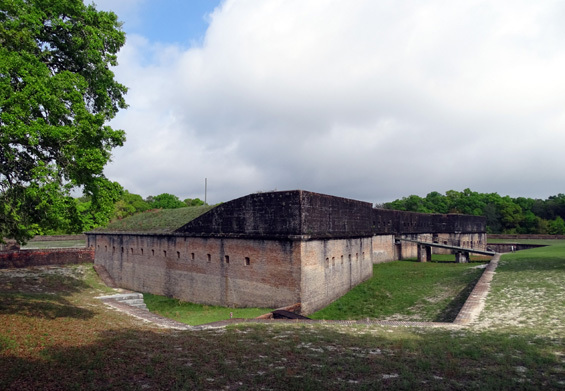 We've visited a bunch of forts around the United States. These aren't the largest or most historically important ones but they are interesting and were very convenient to us while staying near NAS Pensacola. 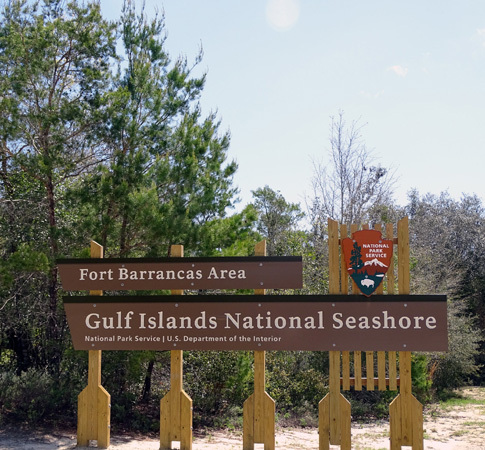 Next entry: day trip to see more of the Gulf Islands National Seashore -- more what you'd expect at a "seashore!"